More on Gulf of Maine Porbeagles – Ya Like Dags? First off, peace to Captain Phil. Recently Underwater Times has linked to a couple more stories about the population of porbeagles interacting with fishermen in the Gulf of Maine. This whole story has some interesting parallels with the spiny dogfish situation, except in this case with a much larger shark with a much less controversial conservation status. First off is the news that satellite tags have revealed the breeding grounds of the porbeagle. We can now add these sharks to the long list of species that utilize the Sargasso Sea for breeding. As Steve Campana points out, this is significant for the conservation of the species. As of right now the area is rarely fished and the sheer depth makes efficient fishing almost impossible. This gives porbeagles a serious advantage over other species that breed in estuaries, which can be crawling with human impacts, and may have a lot to do with the apparent resurgence of these sharks in the Gulf of Maine. Hot on the heels of this research comes a strange consequence of scientist/fisherman cooperation. 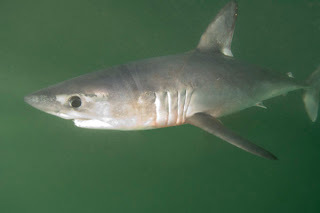 Steve Campana, the same researcher responsible for finding the porbeagle’s breeding ground, is now speaking out against seafood bans in a local grocery chain. His argument is that such bans set a dangerous precedent that could eventually drive fishermen out of business. This may seem like a bizarre comment from a noted shark scientist and conservationist, but his reasoning is actually pretty sound. He argues that cooperation with fishermen is essential for good fisheries science. As usual with fisheries issues, this is far from a black-and-white argument. On one hand you have a grocery chain that has decided to throw its considerable clout behind marine conservation efforts. Some conservationists argue that outright elimination of seafood is essential for preserving the marine environment, and would certainly find no fault with any vendor banning a type of seafood with as bad a conservation record as shark. In this case the seafood ban could potentially protect the very same porbeagles Dr. Campana studies. On the other hand, cooperation between fishermen and scientists is essential to good marine science. Fishermen are out working on the water for days at a time on a regular basis, and notice trends and events that scientists just don’t have the funding or resources to find on their own. At the same time, scientists bring their training and tools to the table when hard evidence and analysis on these trends and events are needed. The combination of the anecdotal observations of fishermen and the analytical skills of scientists can be a match made in heaven, it just requires good communication between the two parties (something that, unfortunately, isn’t that common). So in the process of speaking up for the fishermen he works with, Steve Campana may have opened himself up to criticism for being anti-conservation. I wouldn’t be surprised if there was some fallout from this, and it’ll be interesting to see how those chips fall.